My curiosity with Great Expectations began when posters for the 2013 version began showing up at my local theater in El Paso, Texas. I was intrigued by what looked like an elaborate, sumptuous feature. Yet, despite mass promotion, Great Expectations never actually played here. I was puzzled by that, and as I waited, I began my exploration of this story. Now, we've come full circle. After the original, Oscar-winning adaptation of Great Expectations, and the 'updated' version that set our oft-told tale of a young man's total education to current times, we go back to the source for our third adaptation of the Dickens masterwork. Great Expectations is steady, respectable, beautifully filmed. Why then is it yet another bungled adaptation? This version sticks very close to the original novel (or at least the parts I remember, seeing as I have never been able to get through it despite three times trying). Pip (Toby Irvine as a child, his older brother Jeremy as the adult) is caught by an escaped convict who terrifies the child into bringing him food and a file from his uncle, the local blacksmith. Said criminal is caught and sent up the river, but he doesn't forget Pip's kindness. A few years later, Pip is summoned to Satis House, the home of recluse Miss Havisham (Helena Bonham Carter). She has locked herself away since she was jilted on her wedding day, still wearing her wedding gown and leaving everything untouched since that fateful day, her wedding feast rotting away. She has Pip be a playmate to her adopted daughter, the beautiful but haughty and cold-hearted Estella. Some time later, after Pip decides he would be happier as apprentice to his kindly but dimwitted Uncle Joe (Jason Flemyng), the lawyer Mr. Jaggers (Robbie Coltrane) arrives to tell Pip that he has a strange inheritance from a mysterious benefactor. It's off to London for young Pip, who indulges in being a gentleman and all that entails: membership in a club for spoiled men, racking up debts, dressing well, and sharing rooms with Herbert Pocket (Olly Alexander), whom he met years before at Satis House and with whom he becomes friends with. Over the rest of Great Expectations, Pip's story is intertwined with others, particularly Estella (Holliday Grainger), who has grown beautiful but cold. She toys with him, rebuffing him and yet dangling him. Pip learns that his benefactor is not Miss Havisham, as he believes, but that same criminal from long ago, Abel Magwitch (Ralph Fiennes). Despite the dangers of his returning to England, where he will be returned to prison, he wants to see if his unofficial wards 'great expectations' were met. In those coincidences that Dickens so loves, in short order we find that Magwitch was part of the conspiracy to defraud Miss Havisham (and which involved leaving her at the altar), that Estella was the daughter Magwitch thought dead and whose adoption was arranged by Jaggers, that Estella's mother was Jaggers' maid, and that the man whom Magwitch wants to kill was the same one who destroyed both his and Havisham's lives. As I said, this version of Great Expectations is a straightforward version, sticking very close, if not slavishly close, to the original text. That, I think, is the main problem. David Nicholls' adaptation is very proper, but very dry. The characters, for all their eccentricity, their tragedy, their education, never come across as actual people. It is all very dry, very proper, but like Estella herself, very remote. It's almost as if director Mike Newell and screenwriter Nicholls decided that Great Expectations should combined the ossified world of Miss Havisham with the coldness and aloof nature of Estella. As such, the film suffers from a variety of ailments. It is very slow, it is very mannered, and in some cases, it is very forced. There are three good performances in this version. Fiennes is better than the material as Magwitch, his strange nature hiding a great tragedy, the mixture of revenge and desire to do good being interesting to watch. The best performance is that of Coltrane, whose shifty lawyer is the master puppeteer, forever pulling strings and knowing more than he lets on. Not far behind is Alexander's Herbert, who is the only one who has any sense of joy and doesn't behave on screen if THIS IS ALL SERIOUS. Curiously, I thought Bonham Carter would have been better as Miss Havisham, one of the most legendary of characters. I found her a bit mannered and theatrical as this sad, bitter recluse, forever tortured by her heartbreak. It's the leads that are leaden and dull. Granted, Jeremy Irvine is particularly beautiful to look at, as is Grainger, but Irvine is never able to bring any emotion to Pip, and it was curious that when Pip is supposed to show snobbery towards Joe's more country manners, he looked as if he were trying too hard to make him snobbish. It was very forced, and Grainger was very mannered in her performance (showing she really was adopted by Bonham Carter). It's one thing to portray a woman with a cold heart. It's another to show virtually no emotion. I can't complain about the sets and costumes and cinematography, all beautiful and elegant and posh. I also give credit to Nicholls in making the various twists of Dickens (which I have found a bit too convenient whenever I think of the novel) more plausible and making things a bit more clear for me. That is good. There's nothing horrible in it, but there's nothing in it that makes it anything more than a good companion piece to the end of a reading assignment to Dickens' novel. 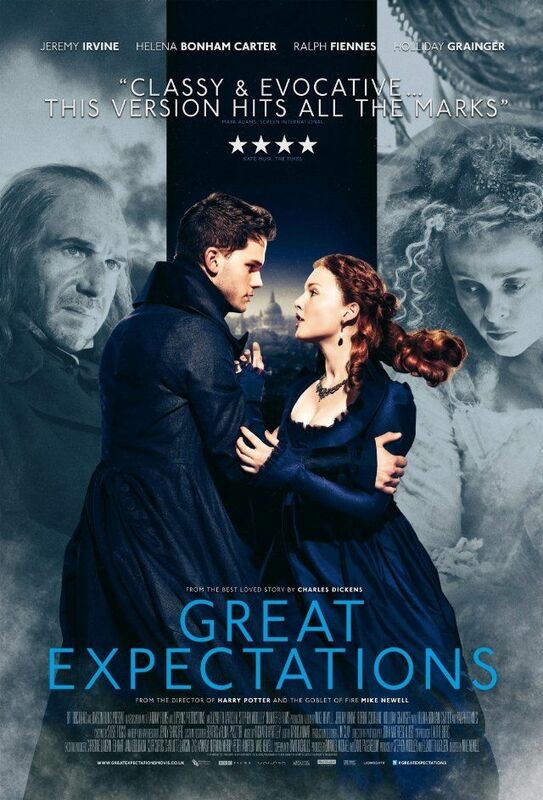 I think on the whole though, this version of Great Expectations is a bit empty and hollow, nice looking but mummified...like Miss Havisham's wedding feast.